On this week’s episode of RotoRob Fantasy Football Weekly Podcast, heard every Wednesday at 1:30 p.m. on Blogtalkradio, Nick Wagner and Josh Johnson were joined by Gene Clemons of Footballgameplan.com. Gene offers up his Shrine Bowl thoughts. We discuss the PFWA All-Rookie Team. We discuss the advantages and disadvantages of the Veteran Combine. Have we seen the last of E.J. Manuel as a starting QB in the NFL? 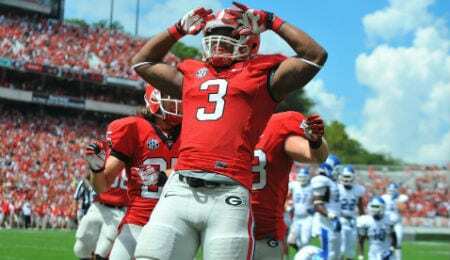 Does Todd Gurley to the Ravens in Round One make too much sense? Which two QBs (past of present) is Marcus Mariota a cross between? Unless we want to have another “Fail Mary” let’s quit banging on the refs. Nick rants about blocking field goals. Prop bets with Chuck Podhaisky of Tellusnewsdigest.com. Who is the best No. 6 in NFL history? We recap the 2014 RotoRob Football Awards. Dynasty dual: Martavis Bryant or Donte Moncrief? Appearing on next week’s Podcast for our Super Bowl Roundtable will be Luis Tirado (Rants Sports), Mike Krafick (Truluv Sports), Brian Genord (Endzonescore.com) and Scott DellaFave (Endzonescore.com). Also appearing will be Jake Tabor from Educks.com.